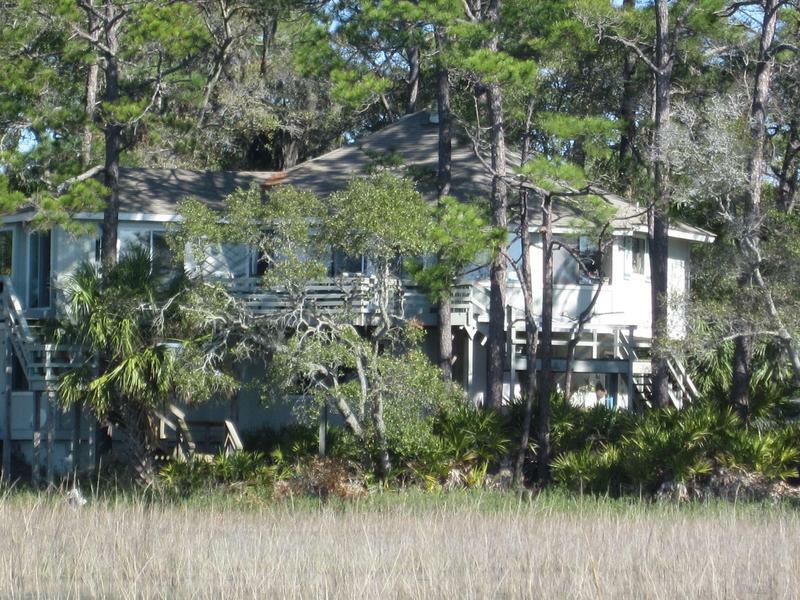 This coastal home is located on a road that seems to magically rise up out of the marsh and is referred to as a “tree house”, as it is nestled in a private, beautiful area of palmettos and pines. The 2800 sq.ft. home is delightful with a 150 degree view of the marsh, where egrets nest in the marsh grasses and soar overhead in the blue sky and you enjoy the distant view of the marina with boats moving out the waterway to the Atlantic. Decorated in a delightful color scheme of earthy blues & greens, it is an extension of the beauty and peaceful setting of nature right outside the door that will take your breath away. The easy living floorplan of 2 levels adds to the comfort and convenience. The first floor has 1 BR, 1 Bath, Family Room and Kitchen. The second floor has 2 BR, 2 Baths, Great Room, Dining, Kitchen, Laundry and Decks... a great solution for 2 couples traveling together. Comfort of this home is not a secret with the many special amenities of down furniture, bose stereo system, dining for 8, dreamy king & queen beds, and a chat group / hammock on the deck.